RMF is much more than basketball. We offer four programs that prepare athletes with disabilities to succeed in life on and off the court. 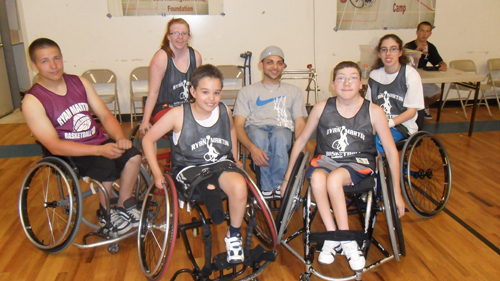 Wheelchair Basketball Junior Program - now available year round! Now it its 8th year ,this one week camp is held during the summer in 3 locations, in the greater Hartford, Philadelphia and Boston areas. In addition to player development, camp includes breakout sessions on relevant topics such as nutrition, exercise and secondary education. Open to all skill levels, beginner to advanced. No charge to participate. Check back for exact dates on locations for summer 2016. RMF is developing basketball camps with the U.S. Army for soldiers living with new disabilities. The camps will expose soldiers to the sport of wheelchair basketball and will help them regain independence and quality of life. RMF offers one-on-one mentoring to youth with disabilities to help them build life skills, gain independence, and set goals for the future.